Q. We just switched over to SharePoint 2013. How do I add a library? A. 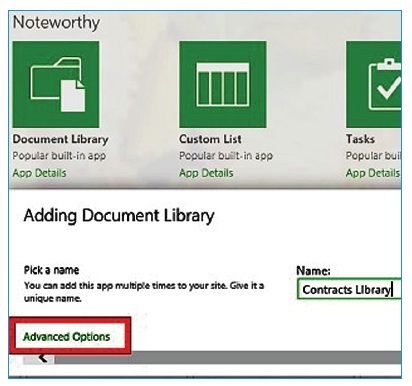 Everything in SharePoint 2010 is called an “app” now. The settings button is in the upper-right corner of your screen (below the browser’s settings button). It looks like a gear. This replaces the Site Actions button that you used to see in the upper-left corner. From the site where you want to add the library, click the Settings button and then Add an app. Document Library will be the first tile you can click on. For more options at this point, click on the Advanced Options link at the bottom left of the dialog box. What's threatening your computer now?